Climate change, globalisation, water dynamics, and multicultural living are only some of the complex phenomena shaping urban spatial performances (Raumgeschehen)ctoday. What does design mean for acting and gaining knowledge when considering these spatial performances in all their dimensions as urban landscapes? How can innovative design strategies be formulated? And what part is played by creativity and understanding? 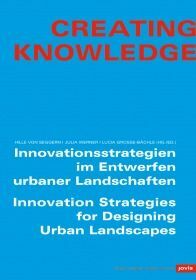 Starting out from design processes at the STUDIO URBANE LANDSCHAFTEN experts from philosophy, neurobiology, psychology, art, sociology, literature, urban design, and landscape architecture unfold their perspectives of how creativity and understanding are connected. Examples of internationally renowned landscape architecture indicate how closely the production of ideas, design practice, and aesthetic expression are bound up with an understanding and investigation of landscape. Creating Knowledge thus formulates a contemporary, interdisciplinary approach of design.